What are the cosmetic uses of hydroquinone? 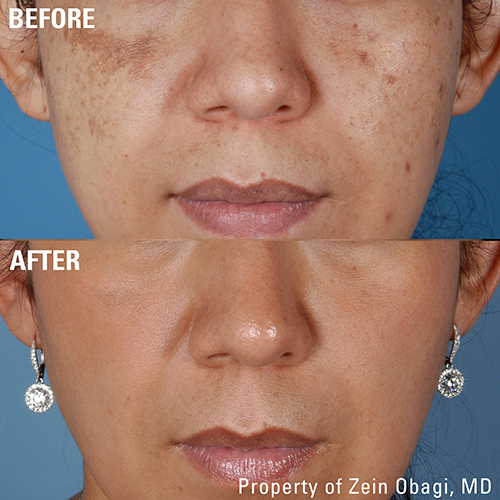 Hydroquinone is used to treat sunspots and hyperpigmentation and when used via Dr. Zein Obagi’s extensively researched guidelines, the results are extremely simple, effective and safe. It should always be prescribed by a trained and qualified Medical Practitioner and should not from any source other than a Pharmacy with a legal prescription from a Medical Practitioner. Through an entire Hydroquinone treatment, it is advised to use a non-Hydroquinone product alongside it. Furthermore, Hydroquinone should not be used for any longer than four to five month, with at least twelve weeks given for the skin and melanocytes to stabilise. It is also recommended that a Non-Hydroquinone product continue to be used to help in stabilising and controlling the melanocytes activity. If, however, the pigmentation increases post-treatment, you could consider another pulse treatment for another four to five months. Although, it is advised that the Hydroquinone be combined with a Retinoic acid to limit skin bleaching and to help even out the colour and tone of the skin. Additionally, it is recommended that a product with botanical anti-inflammatory agents and antioxidants like the Daily Power Defense be used, to assist in stabilizing the melanocytes and suppress the triggers of pigmentation, such as sun exposure or inflammation. It is important to note that using excessive Hydroquinone concentration can cause many problems from unmanageable hyperpigmentation to toxic effects such as acute skin inflammation and melanocyte hyperactivity, leading to rebound hyperpigmentation. https://zo-skinhealth.co.uk/wp-content/uploads/2016/03/Hydroquinone-1.jpg 620 1200 Alex https://zo-skinhealth.co.uk/wp-content/uploads/2018/05/ZO-Skin-Health-PMS072C.png Alex2016-03-08 17:01:502018-09-28 11:16:41What is Hydroquinone?